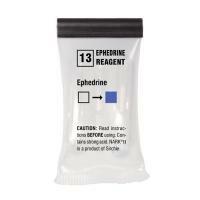 Test suspicions of ephedrine and pseudoephedrine using the NARKII Test 13 from Sirchie. Featuring an innovative, fast-acting formula, the test offers immediate identification of narcotics while out in the field. Designed for simple and effective use, NARKII Test 13 requires virtually no training to successfully use. Simply open one of the reagent pouches and add a small sample of the suspected narcotic. Close the pouch and squeeze to break the second internal glass container, shake and wait. If either ephedrine or pseudoephedrine is present, contents will turn purple/violet in color. If no reaction occurs, turn the bag upside down to further agitate the liquid reagent. If suspected substances are present, a distinctively colored residue will be left behind.